What Is a Metacarpal Fracture? Metacarpal Fractures refer to a break in one of the long bones of the hand called metacarpals. The metacarpals are the five bones located between your wrist bones and your fingers. Metacarpal fractures occur as a result of any direct trauma to the area such as punching or a hard blow. This makes fractures common in sports such as martial arts (Tae Kwon Do, Jujitsu, Judo, Yudo, Zen Do Kai, Hapkido, and Capoeira) and boxing. 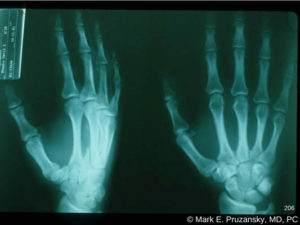 Metacarpal fractures are commonly known as boxer’s fracture and frequently happen in the small finger metacarpal bone. A fall onto your hand or impact with another object like an opposing players equipment may also cause this type of fracture so this injury also occurs in other sports such as football, rugby, and basketball. Metacarpal fractures are indicated by pain, numbness, swelling or bruising of the area. A careful physical exam and the findings on an x-ray will identify the diagnosis. Patients usually experience a strong, forceful blow to the hand from punching or absorbing impact from a fall or from the hand being crushed. Metacarpal fractures are very painful with the pain focused directly over the fractured bone. In addition to the swelling and bruising in the area you may have difficulty moving your fingers due to the intensity of the pain. The physical exam may reveal fractured ends of the bone which may move if pressed. Bending the patient’s hand inwards towards the palm can help to determine if the fracture is angled. 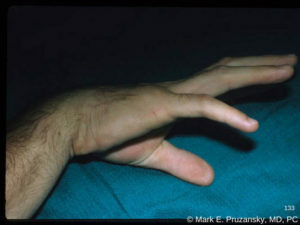 The patient may be asked to make a fist to diagnose rotational deformity of the fracture which means that the fingers do not line up properly and are not parallel with each other. A rotated fracture will cause the injured finger to lay over or under the finger next to it. A metacarpal fracture can occur in any sport although the highest risk is in those sports where there is a risk of a high energy impact occurring to the athlete’s hand. Classically this occurs in boxers and other athletes involved in the martial arts. However other impact sports like football and rugby place the competitor’s hands at risk of impact against things like opposing players’ helmets and pads as well as the ground itself. The little finger metacarpal can tolerate more angulation than the other metacarpals because it can compensate with its greater mobility at the joint at its base and due to the hand’s natural curvature. Consequently, most fractures with or without mild angulation can be treated with simple immobilization in a brace or cast. More severely angulated fractures may benefit from surgical realignment and stabilization to restore correct hand mechanics and range of motion of the finger. Metacarpal fractures are normally treated by plaster cast or splint, although unstable or misaligned fractures may demand operative fixation using pins, screws and plates. Metacarpal fractures are periodically x-rayed to make sure that the fracture is healing and the bones are properly aligned. Surgery may be necessary to stabilize a metacarpal fracture when there is severe angulation, displacement, rotation, tendon laceration, or an open fracture with broken skin. If operative stabilization is needed, minimally invasive surgery is performed to make a small incision to realign the fracture and fix in place with pins, screws, and plates. The hand and wrist are immobilized in a splint, cast, or occasionally a removable splint whether surgery was performed or not. Metacarpal fractures may take several months to heal but some activity, running for example, can be resumed depending on the severity and stability of the fracture. Some athletes may be able to use a removable protective splint if it doesn’t impair their ability to compete. A Scaphoid Fracture requires prompt diagnosis and treatment to obtain adequate healing, as the bone’s weak blood supply can lead to non-healing and arthritis of the wrist joint. Call Dr. Pruzansky at 212-249-8700 to schedule an appointment.